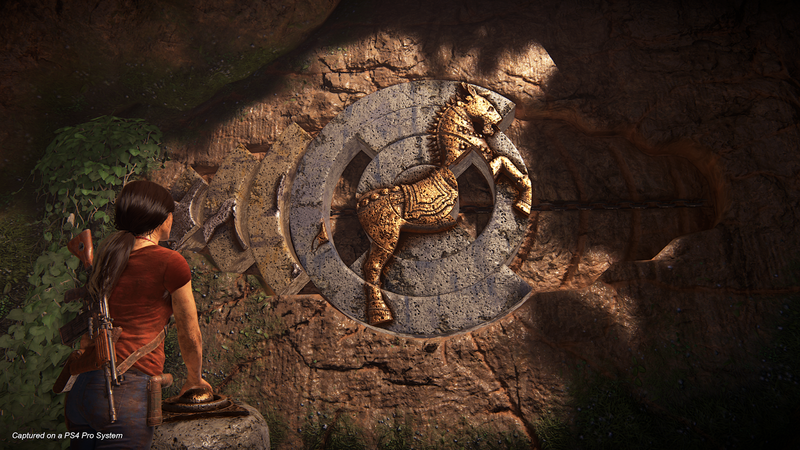 Uncharted fans are going to absolutely love Uncharted: The Lost Legacy. That might sound like an obvious statement to make, but for all the hype behind having an Uncharted game where you’re not in control of a Drake, I think it’s an important statement to make up-front; Naughty Dog hasn’t messed with its formula in any substantial way, while at the same time expanding the series horizons by looking at a different set of characters, and surely that’s exactly what fans want. I had the opportunity to get some hands on time with a section of the game ahead of its launch next month. Personally, I’ve had my reservations with the series, and as a result of the game being so familiar it’s also clearly not going to address those reservations, but of course Uncharted is an incredibly popular franchise for a reason and, personal feelings aside, there’s no ignoring the sheer quality of the game on display. In the section I got hands on time with I was presented with a large map to drive around, and my choice of a number of ruins within that to explore – those ruins each having objects to find that would then drive the narrative further forwards. The map itself offers a lovely perception of scale, I’ve got to say. There’s not a whole lot to actually do within it except drive around, so it’s less an “open world” experience than an incredibly glorified menu with key destinations to choose between (by driving to them), but the protagonists, Chloe (who the player controls) and Nadine (AI), will chat to one another between destinations which helps to build their characters up and put the game in greater context, and that’s a good use of downtime. 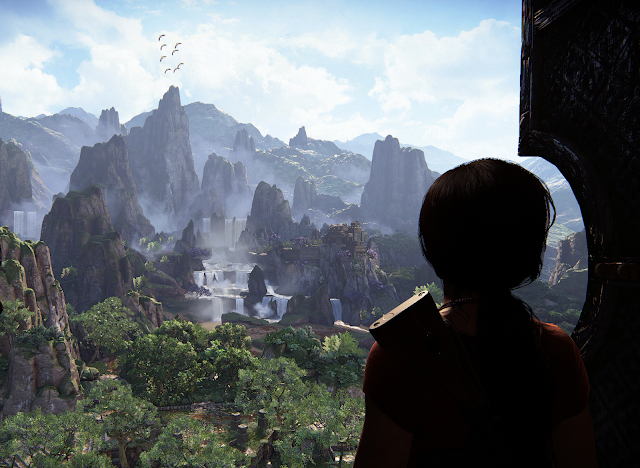 Once Chloe and Nadine arrive at one of the ruins, the experience shifts completely. The one ruin I explored in my time with the demo was filled with enemies and a basic environment puzzle to solve. This stuff was all vintage Uncharted, for all its good and bad. The main issue I had with it is my standard complaint with Uncharted; I had the opportunity to stealth my way past all the enemies, and even avoid killing them, only for all that work to be completely pointless because the game decided I just had to have a set-piece gunfight. Using long grass and climbing around outside of the enemy’s field of vision and patrol routes, I was able to get Chloe to her objective; a giant door, without hurting a soul. Then in trying to open the door Chloe made such a noise that it caught the attention of every soldier she had just snuck past, and she had to kill them all anyway. Why give players the option of stealth if it doesn't matter in the end? There appeared to be no way to open this door without making noise, either, so it appeared that there was absolutely no non-violent solution to the ruin. After Chloe and Nadine killed all the enemy guards, I discovered that they then needed to find five rock “keys” scattered around the ruins in order to open the big door. This was shaping up to be a painful process of running around like crazy until spotting them through luck, but then Nadine’s AI kicked in and started spotting and activating the “keys” herself. I really liked this touch in using AI to help people struggling to find the proverbial needle in the haystack. It will save some people from wasting too much time and potentially getting frustrated. In this instance, Nadine actually found three of the five “keys”. Then, with the big door leading to the treasure vault behind it, Chloe finally got her clue and it was time to jump into the car and drive to the next one. 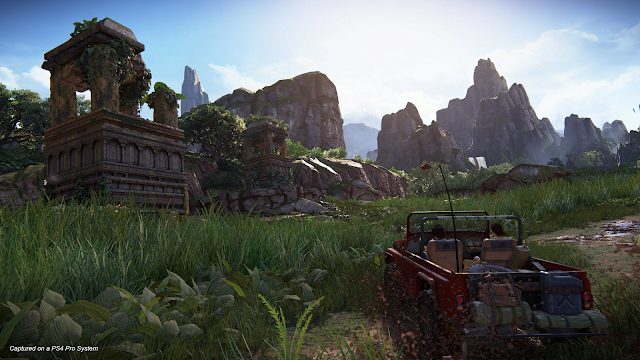 Everything about the game feels exactly like Uncharted 4 from last year did, and that of course is not a bad thing. Guns feel good in the hands, and when Chloe needed to clamber around rocks and ruins she was agile and athletic. I get the feeling that Uncharted fans will appreciate the chance to get to know two of the more enigmatic characters from the franchise better. As an initiative to broaden the Uncharted universe, this casting was actually a masterstroke, as Chloe and Nadine clearly have a good rapport, even from the minimal time I had with them within the context of the overall game. What concerns me more is the setting and antagonist, an Indian fellow called Asav. I’m not convinced the game’s narrative is going to address the fact that our two heroes are “treasure hunting” ancient Indian artifacts, Indiana Jones style. India being one of the nations that the colonial west once did plunder, the fact that the heroes are outsiders themselves isn’t a great allusion to that. Naughty Dog has also shown that historically it has not been the most aware developer when it comes to justifying the motives of its heroes, either. In other areas, it’s great, and I know that the game will be celebrated from because it’s a narrative about two strong, empowered women, and one of the is black. Diversity and good women protagonists is always great to see and should be celebrated, but a lot of that good work’s going to be undone if, in the end, the game really does allow support colonialist rhetoric and attitudes. Of course, I want to hope that Naughty Dog has put more thought into the narrative, and the hands-on I had was by no means sufficient to start drawing conclusions about it. Either way it won’t matter; I just can’t see this game falling flat with anyone who has enjoyed the previous Uncharted games, no matter how it presents its story, and most people who have played the Uncharted games enjoy them. For a game that was originally intended to be a bit of DLC for Uncharted 4, it’s quite impressive that Sony and Naughty Dog has clearly managed to build it out into what is sure to be a major hit for both companies in the back half of the year.